Any driver of any vehicle, much less trucks, knows that when the weather is bad extra precaution must be taken in the operation of the vehicle. This is especially true for large tractor-trailer trucks that are much heavier in weight and therefore more difficult to slow down. The Federal Motor Carrier Safety Regulations require that drivers of motor carriers use “extreme caution” in the operation of trucks during hazardous conditions such as those caused by snow, rain or any other weather event which adversely affects visibility or traction. Speed must be reduced when such conditions exist. Most state Commercial Driver Licenses Manuals require that truck drivers slow down at least by one-third (⅓) of the posted speed limit in order to insure the safe operation of their heavy tractor-trailer rigs. Because it takes longer to stop and is harder to do so without skidding or losing control if it is raining or snowing, the driver must slow down from 55 to 35, as an example, on any wet road. On packed snow most commercial drivers’ manuals require that speed be reduced by half (½). 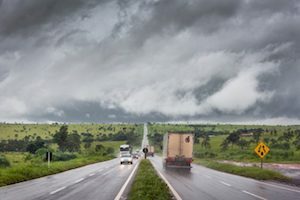 The motor carrier safety regulations are very important in helping to establish negligence of a truck driver who is speeding during adverse weather conditions. Even if a truck driver is traveling within the posted speed limit, he may still be in violation of the Federal Motor Carrier Safety Regulations because traveling at 55 miles per hour, which may be the posted speed limit in any particular area, may still be too fast for conditions and under the Federal Motor Carrier Safety Regulations is too fast for conditions when the weather is adverse. In any case involving adverse weather conditions, counsel should investigate very carefully whether excessive speed was involved and/or whether the driver and carrier used “extreme caution” for the safety of the motoring public. If not, a proven violation of these safety regulations can help to establish liability against the trucking company and its driver.